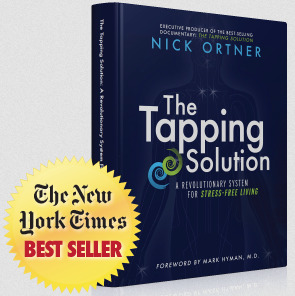 Learning EFT will absolutely open up the possibilities for change and allow you to become a happier, healthier person. My goal is to help create more awareness about the Emotional Freedom Techniques and to help it grow quickly and watch this simple tapping technique become an everyday practice for millions. Believe me...it's really exhilarating once you take the first step and try this tapping technique just once. It's very empowering to have this kind of tool at your disposal 24/7 during moments of stress, anxiety, pain, fear, doubt or just everyday annoyances. Okay, let's start with the basics of the actual EFT tapping technique which was developed by Gary Craig. Originally the tapping technique was developed using the 9-Gamut method which included the individual finger points. Actually, if you read Gary's EFT instruction manual you'll see that the 9-Gamut method is still included. However, a modified, shorter version is now widely being used by EFT practitioners and has proven to give the same amazing results. Additionally, through their work with clients, many practitioners have discovered new tapping insights that they have contributed to the community that have advanced and evolved the techniques. Here is a sample modeled after the work of Founding EFT Master Practitioner Carol Look. The topics are endless, but all very personal to you. You can start anywhere you want, JUST START! Next, IDENTIFY where in your body you feel the strongest sensation. Do you physically feel a knot in your gut, lump in your throat, tightness in your shoulders or chest, an ache in your back? Then, identify a specific past event where you felt a similar sensation, a childhood event works best. How uncomfortable, angry, sad, or hurt do you feel? Say a related statement out loud like, "I am SO nervous about making this phone call to my boss/client/spouse/mother." Ask yourself "How true does this statement feel for me? Then you measure the SUDS rating before and after. Pay attention to how you feel before you tap so that you can have a scale to measure your results by. The goal is to FEEL what level you are currently vibrating at and then improve upon it. ie: "Even though I am really nervous about making this phone call to my boss, I love and accept myself anyway." KC: "Even though I am really nervous about making this phone call to my boss, I love and accept myself anyway." KC: "Even though I feel really nervous about calling my boss, I love and accept how I feel." KC: "Even though I am really nervous about making this phone call to my boss, I love and accept how I feel right now." Side of Eye: What if it doesn't go well? Take a deep breath in through your nose and exhale out your mouth. Now, RATE your intensity level again and notice if it's gone down on the scale. Try saying your statement aloud again, "I'm so nervous about making this phone call to my boss." Repeat this process until you can lower the level to a 3 or even a zero, if it's not down to a zero, try doing another round saying, "Even though I still have this nervous feeling...." "Even though a part of me is still nervous....". Once you drop it down to a more comfortable level, you'll be in a space where you can take new action with less anxiety and get a better result. 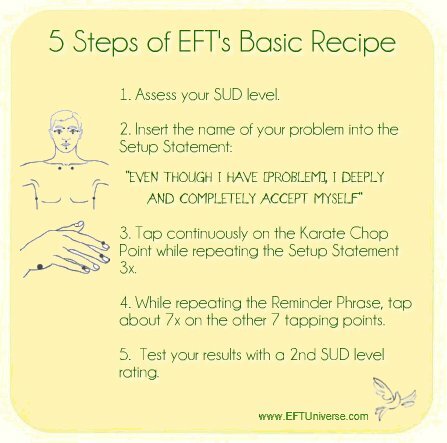 This example of learning EFT is a very simple introduction and there are many more nuances that can/should be used in your Tapping so please check out several of my favorites in my FREE ESSENTIAL EFT TAPPING TIPS PDF.